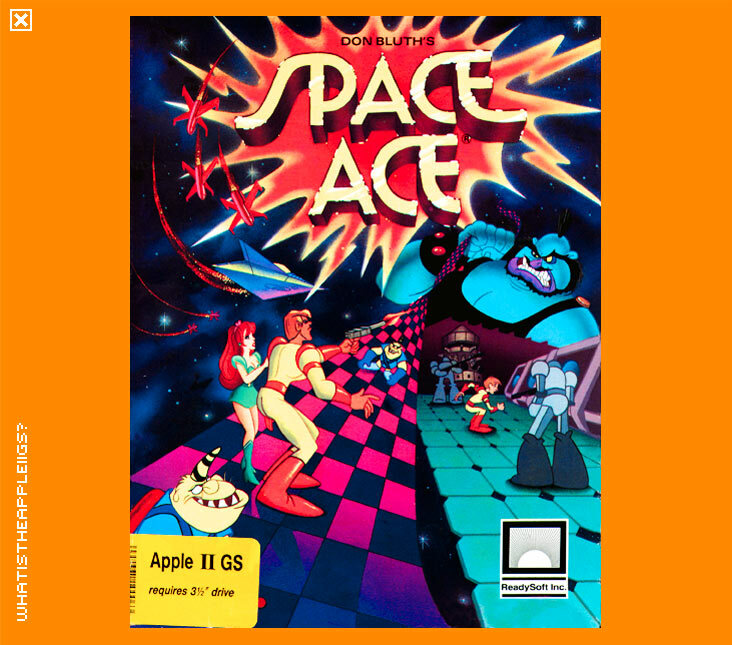 Space Ace was one of the last mainstream commercial IIGS releases around 1990-91. Space Ace was originally an arcade game of the early '80s that used laser disc technology for its breathtaking graphics and animation. Its predecessor was Dragon's Lair, the first game to use laser disc and like Space Ace, the animation was created by Don Bluth (whose company was behind many animated feature length films). Because the game's main claim to fame was the animation, it created a new type of gameplay, or as some gamers might see it, if you push the right combination of buttons at the right times, you'll see the rest of the movie. As far as I'm aware, Space Ace and Dragon's Lair were both popular in the arcade and sequels arrived later. Certainly they must have been popular, because Space Ace and Dragon's Lair were ported to many different platforms such as the Amiga, Mac, PC, Atari ST and even the Commodore 64! CD-ROM versions were released for PC and Mac as well as re-releases of Dragon's Lair and Space Ace on DVD - which apparently will use the original animation of the arcade games. But enough of the game's history and onto the plot. The evil Borf is attacking earth with his Infanto Ray, which gives him the power to turn anyone who gets in its way into a helpless baby. Only you, as Space Ace, can stop Borf! But there's a catch - upon approaching Borf's ship with the beautiful Kimberly, Space Ace is hit by the Infanto Ray and his weaker alter-ego Dexter is the result. Space Ace is played entirely from the keypad, with "0" being the fire button. 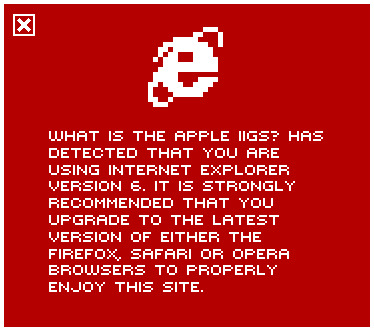 Just like the arcade version, the IIGS version predominantly features animation and the gameplay's not going to get in the way of that! You have to enter in the right moves to continue onto the next scene. That's it. It's entirely linear, and cannot deviate from the one way to finish the game. For instance the first scene will involve Dexter dodging Borf's lasers as he darts around you, trying to get a clear shot. Watching the animation and knowing that you have to dodge the lasers, it becomes obvious in which directions to move. I won't tell you how to get past the first level because it IS easy and it will help familiarise yourself to the game: because from there, it gets tougher. You will either love or hate Space Ace. It's quite a different experience to playing other arcade game conversions, but some will utterly hate the linear nature of the game and give up knowing that what they have tried to keep Space Ace alive was perfectly logical. At worst, Space Ace is a game of trial and error. You'll NEED patience and an open mind as to which combinations of moves to use. The IIGS version of Space Ace is pretty good. However there are some negative aspects of the game that will further frustrate players. One of those was that Space Ace was NOT hard drive installable. For a game to be released around 1990 this was a fairly inconsiderate oversight to not include such a feature when the game comes on NINE disks; that's a LOT of a disk swapping. What made it doubly annoying is that the game isn't copy protected! The newer version by 'Burger' Becky Heineman has rectified that however (and included in this archive). The second big issue with Space Ace is that the IIGS version won't save games for you. When all your lives are over, you have to start from the beginning. That provides more of a challenge but you'll be tearing your hair out if you die on the levels you've already mastered and played so many times. Space Ace under emulation is a treat after playing it by floppy disk. I was no longer tearing my hair out and could concentrate more on the game instead of being interrupted with disk swaps. The game emulates perfectly by the way. I'd go so far to say that when I bought Space Ace in 1991, I wasn't sure it was a good purchase. But now, it's like its value is more easily appreciated. Enjoy!